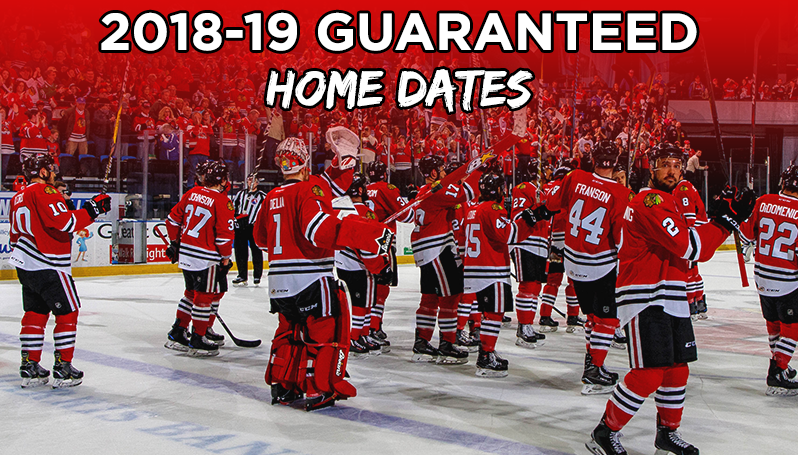 ROCKFORD, Ill. – The Rockford IceHogs today announced six guaranteed home dates for the upcoming 2018-19 season, beginning with the Hogs’ home opener at the BMO Harris Bank Center on Saturday, Oct. 13 at 6 p.m. The 2018-19 campaign will mark the IceHogs’ 20th season of professional hockey in Rockford and 12th as the top affiliate of the Chicago Blackhawks. The IceHogs will follow their home opener on Saturday, Oct. 13 with reserved dates for weekend home games on Dec. 8, Feb. 1, Feb. 16, March 2 and March 16. Fans may purchase group or season-ticket packages for these announced dates by calling the IceHogs front office at (815) 986-6465. Additional information and further pricing options are also available online at IceHogs.com. In addition, the IceHogs will also host their annual School Day Game on Wednesday, Nov. 7 at 10:30 a.m. For information or to register your school, call the IceHogs at (815) 986-6465. The complete schedule for the 2018-19 season, including game times and opponents, will be released at a later date this offseason. Season Tickets for 2018-19 on Sale Now: Don’t miss a moment of the action by reserving your seats for the IceHogs’ 20th season of professional hockey in Rockford and 12th as the top AHL affiliate of the Chicago Blackhawks. The IceHogs’ home opener is set for Oct. 13 and ticket packages begin as low as $105 for a seven-game mini pack. Please contact us at (815) 847-6399 or visit icehogs.com to claim your spots for this upcoming season.